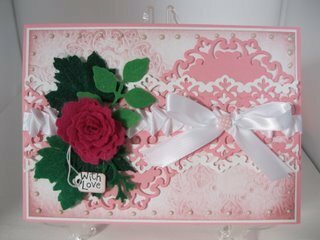 Creating beautiful Felt Flowers with Spellbinders can make your cards stand out from the rest. They can be added to all your girly creations and they are sure to be well received. Who could resist them especially when they are made and sent with love. will give you some information that can help you make your choice when you go shopping... and you are faced with all the wonderful dies that are available to you. 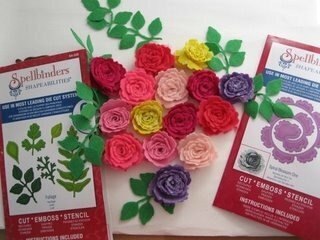 These flowers can be added to any of the cards featured in the Spellbinder Series of videos. These are some of the colours I chose and I also picked two shades of green for the leaves. It was not expensive and it went easily through my Die Cutting Machine. 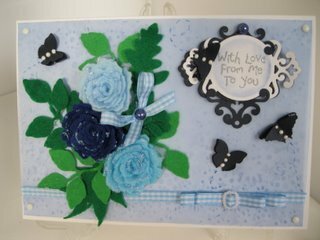 So make yourself a cuppa and settle back to watch the short video that will show you how to make this lovely card for yourself. Once you have made the flowers you can dress them up any way you want. Into the centres of some I have added the brads, pearls or even another smaller flower, or try adding the stamens to make them look realistic. Around the edges on some others I have added glitter to make them sparkle a little. But whatever you do even if it is to leave them as they are ... they are sure to look good when they are added to your designs. 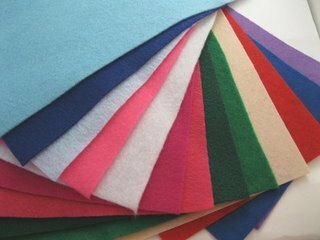 We have made flowers from punches, ribbons, organza and paper, so I hope you will try Felt Flowers with Spellbinders for your next project.